At CF Shops at Don Mills in Toronto. Photo supplied by Structube. 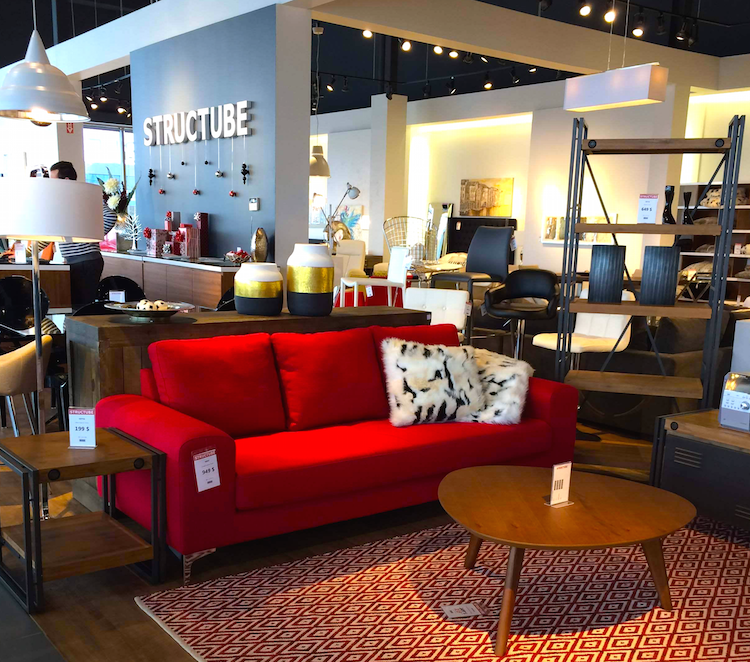 Montreal-based, affordably-priced contemporary/modern home furnishings/accessory retailer Structube plans to continue expanding its Canadian operations after considerable success. The company will enter the British Columbia market this year with three confirmed locations, and it will continue to expand into other markets to be close to its consumers -- including a massive new Montreal flagship set to open this fall. The family-owned retailer was founded in 1974 and currently operates 47 Canadian stores. The company originally specialized in tubular retail clothing racks, hence its name 'Structube', being derived from an abbreviation of the French term "structures tubulaires". Its first home furnishings store location opened in Montreal in 1980, expanding into multiple Quebec locations before entering the Ontario market, followed by Alberta, Manitoba and Nova Scotia. Prices are competitive with other value-priced home furnishings retailers, and can be viewed on Structube's extensive Canadian e-commerce site which launched in May of 2015. A U.S. e-commerce site also launched in November of 2015, in anticipation of a larger expansion. Structube's marketing director, Tony Trew, explained that the retailer is looking to expand into new markets to be closer to its clients. The retailer recently lowered its prices which resulted in a considerable spike in business, hence new growth plans. He noted that Structube has been in expansion phase for the past decade, after initially gaining brand awareness in Quebec. Click the above screen shot to see these products on Structube's website. Mr. Trew confirmed several new Structube locations. Three Vancouver-area stores are confirmed to be opening this year, including locations at 140 West Hastings Street in Gastown (opening later this month), at Station Square in Burnaby (opening in early September) as well as on the tony South Granville strip at 2401 Granville Street (opening mid October). Another Toronto location is also confirmed to be opening this month, at 2008 Yonge Street, about two blocks north of Davisville Avenue. Structube will also open a large Montreal flagship in October, measuring about 11,000 square feet, in a new development at 375 Blv. Réné Levesque (corner of Rue Saint-Denis) next to the University of Quebec/Montreal campus. Structube's contemporary style furniture ranges from rustic wood and mid-century to sleek lacquer and glass, with both pre-assembled and easy-to-assemble products. The company caters to young professionals, condominium dwellers and even small businesses. Structube also recently tripled the size of its state-of-the-art Montreal fulfillment centre to an impressive 250,000 square feet.